More than 7,500 varieties or “cultivars” of the apple have been known, and one of them was “discovered” in Ridgefield. However, you’d have a hard time finding Amos Baker’s fruit today. Bedini got this story from Rockwell’s “History of Ridgefield,” published in 1927. Rockwell also said the apple was known “throughout the country” which may have been a bit of an exaggeration. The Baker was probably never grown much beyond Connecticut and New York. Today, in an era when you’d be hard pressed to find a store or even orchard selling more than 10 different kinds of apples, the Baker apple is virtually unknown. Even the scientifically overseen orchards at Cornell University, with nearly 60 varieties, and the commercial Trees of Antiquity, with 176 varieties, have no Bakers. The two-volume “The Apples of New York” by Beach, Booth and Taylor, published in 1905, describes the Baker as “a red apple of good size, pretty uniform in size and shape, and of fairly good quality. It is not so good a keeper as Baldwin and is inferior to it in quality and hardly equal to it in color. “The tree is hardy, healthy, vigorous, and reliably productive with a tendency to biennial bearing. There is a considerable loss from the dropping of the fruit. 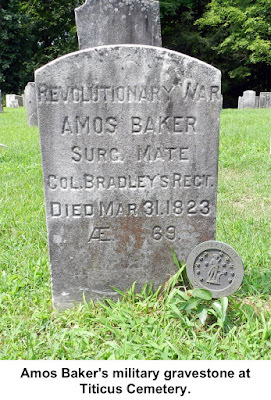 Amos Baker was a prominent character in late 18th and early 19th Century Ridgefield. He was born around 1753. His birthplace is unknown, but may not have been Ridgefield. He was certainly living here by 1780 when he and his wife, Sarah, began recording the births of their children in town records. 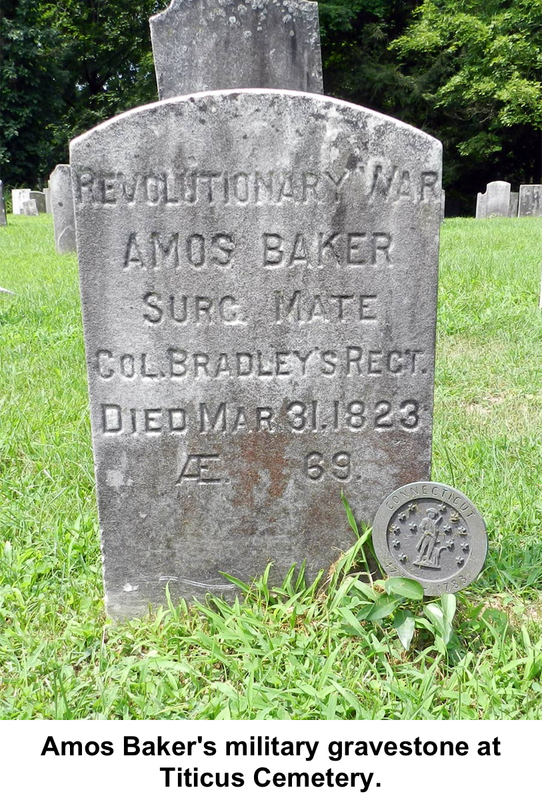 Baker was a surgeon’s mate with Colonel Philip Burr Bradley’s battalion at the Battle of Ridgefield in 1777 and was part of Captain Isaac Hines’ Company at the Alarm at Fairfield in 1779. Perhaps his service with Colonel Bradley — whose home is where Ballard Park is today — introduced him to Ridgefield and its need for a doctor. Baker’s house, it turns out, was just north of Bradley’s, on Main Street — about across from the old Elms Inn. Dr. Baker was an organizer back in the early 1800s of what is now the Jesse Lee Memorial United Methodist Church. “His kitchen served as one of the several meeting places for the first classes that were formed,” Bedini said. Perhaps that kitchen also produced the world’s first Baker apple pie.